If you enjoy rebounder exercises or are considering taking this activity up, purchasing a rebounder for home use can be a good option. Owning your own rebounder will allow you to reap all the health benefits of rebounding without forking out on pricey gym memberships. However, with so many different brands and models on the market, it can be hard to know which is the best rebounder to you. A brand that has recently caught our eye is the budget-friendly Marcy rebounder. So, should you consider this model? Read on for our Marcy trampoline review. What Makes the Marcy Cardio Trampoline Stand Out? How Does Marcy Compare to Other Brands? Where do I find the Marcy Rebounder with handle for sale? Currently retailing at around $50, this rebounder is one of the most affordable models on the market. Check the latest price on Amazon here. It is specifically designed with adult fitness training in mind. However, at such a low price, will you be getting a quality product? To help answer this question, we've taken an in-depth look at the benefits and drawbacks of this trampoline. Here are the key features of the Marcy rebounder. Dimensions: 40.5" x 40.5" x 44.5". Elastic cords: This rebounder uses bungees instead of springs to provide that all-important bounce. Bungees give a rebound that has less impact on the joints, and are much quieter than springs. However, this is a matter of personal preference, as some users prefer the firmer bounce that springs provide. 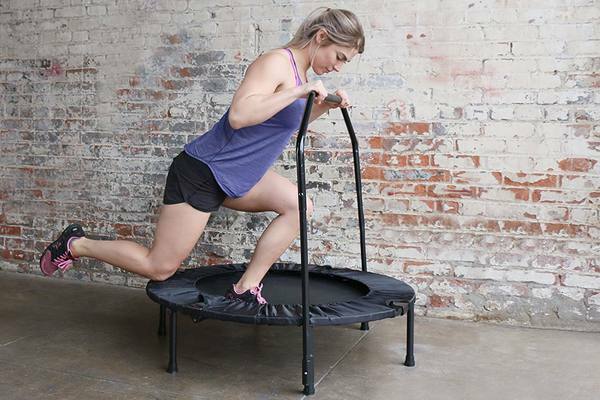 ​Stability bar: This rebounder comes with a stability handle. A stability handle makes using the rebounder safer, and is particularly important for seniors or those with balance or stability issues. ​Foldable design: Some customers prefer a folding rebounder, as it makes the trampoline portable. You can simply fold it up and then take it to the gym or away on a trip with you. Also, this is a useful feature for those who are short on space, as you can fold it up and store it when not in use. Protective cover: The bungees are protected by a cover which prevents you from getting your feet caught in the gap between the jumping mat and the frame. Getting your feet caught can lead to trips and injuries, so this is a useful and practical safety feature. The most immediately apparent standout feature of the Marcy trampoline is its price. It is one of the cheapest rebounders available for purchase. This makes rebounder ownership highly affordable to most people, meaning that everyone can enjoy the health benefits. Before you decide to purchase a Marcy rebounder, you'll want to know if it is comparable to other leading brands in terms of safety and quality. 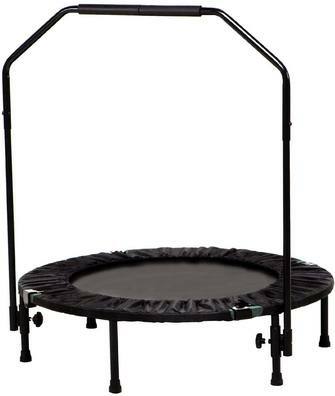 In comparison to other rebounders that use bungees such as the Jumpsport models, the Marcy rebounder comes in at just a fraction of the price. Therefore, if you are finding other products unaffordable, this may be a good option for you. It is also foldable, like the more expensive Cellerciser brand. 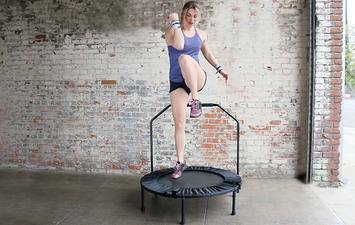 On the other hand, the Jumpsport and Cellerciser models have far higher customer satisfaction than the Marcy rebounder, and it seems that the overall consensus is that these rebounders are more durable than the Marcy trampoline. You will need to decide whether it is worth shelling out more to get a more high-quality, long-lasting product. The Marcy trampoline has an upper weight limit of 250lbs. This is pretty standard for home-use rebounders, although there are other brands out there that have a higher weight limit of up to 300lbs. If the price point makes rebounding accessible to people who would otherwise be unable to afford it, then we think that's a great thing. After all, there are many benefits associated with rebounding, including weight loss and improved cardiovascular health. We also like that this rebounder comes with a stability bar as standard. This improves safety, and makes the rebounder more suitable for seniors and those who struggle to maintain balance. The safety cover is another great feature, as it is possible to sustain nasty injuries from getting your feet caught in the gap between the frame and the jumping mat. We're pleased that Marcy have included this on their rebounder model. Whilst there are many satisfied Marcy customers, user reviews are a real mixed bag. Some users report that the folding mechanism is difficult to use, and that it closes with a sharp snap, catching their hands. Therefore, please be very careful when folding your rebounder. Also, lack of durability is a frequent complaint with these rebounders. Some users report that their rebounders have broken or worn to an unacceptable level after a short period of use. If you want to be sure that your rebounder will stand the test of time, it may be worth considering spending a bit more on a more durable brand. The Marcy Rebounder with handle can be purchased on Amazon. Click here to check latest prices on Amazon. Now you've read our Marcy trampoline review, you have all the information you need to decide if this rebounder is the right product for you. If you're shopping on a tight budget, the low price point of the Marcy trampoline makes it extremely affordable. However, as with any rebounder, please carefully consider the pros and cons before making a purchase. While this trampoline is cheap, it may be worth considering spending a little more to get a more durable and high-quality product. Click here to buy on Amazon.